Martin explains... We started Pawsome Organics in 2017 when one of our dogs was struggling after his 2nd cruciate surgery. We didn’t feel comfortable pumping him with tablets and we hated seeing him miserable, so we started looking into natural remedies and stumbled upon Turmeric. We thought if it works for humans why not try it on him. He quickly showed improvement and then the idea of Pawsome Organics was created. We started looking into the visibility in the dog food industry and found that so many bad things are hidden in dog foods and that customers are duped into believing the food they give their pets contain highly nutritious ingredients; we decided we wanted to do better". Martin continues...."We have carefully chosen ingredients with great health benefits and have been very particular about only buying 100% certified organic products. We have a deep respect for organic farmers and what they are trying to do for the planet; our food is so full of chemicals and we believe they are causing a lot of harm to our health. We have put a full nutritional panel on our labelling to ensure you as a customer know exactly what you are feeding your dogs. Visibility is a big thing for us as consumers, we prefer to know what we are putting in our own body and we want to know what we feed our dogs as well". 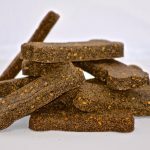 Hemp and Banana: Our Hemp and Banana treat assists dogs’ overall health. Hemp seeds are a little ball of nutritious components. The perfect ratio of omega 3 and 6 and all the essential amino acids made it an ingredient we couldn't surpass.